What the sequence above doesn't say, which is more important, is that for every successful attempt, there are probably fifty (a hundred?) unsuccessful ones, where the best runners in the world are on course for the time, for some of the race, then fall away. Every year, five or six big city marathons start with high hopes - London, Dubai, Chicago, Rotterdam, Frankfurt, Berlin and perhaps two or three others. Across these races, there are likely twenty "viable candidates", and yet perhaps one in a hundred will come off, despite intent and incentive. That's why when you look at the record books, you'll see that there are now about 50 performances under 2:06. Most of those started out as record attempts, and many will have had high hopes up to halfway, or even 30km. In London earlier this year, about six of the best marathon runners in history went to 25km on course for the world record. The explosion was huge, and some ended up finishing outside 2:09, or not at all. I recall Emmanuel Mutai closing at 5:00/km. The same happens every year in many races. Even in Berlin yesterday, only one man of a group of three sub-2:06 guys held on to run a 61:51 second half. Incredible running, but it should highlight just how rare successful attempts are. The marathon course is nothing without the best athletes, and so now you also need huge money to attract the best men, in the right numbers, for a record. London has in the past been so strong that the athletes watch one another rather than risk losing to chase times. New York gets amazing fields, but the course compromises the final time. Second-tier marathons with perfect profiles can't get the depth of quality to deliver the record. The problem then is that there are only a few opportunities a year for the top guys to have a realistic shot. Now the above three factors need to come together - you need perfect weather on the perfect course, with the best athlete in close to perfect condition, and suddenly you can see why unsuccessful attempts outnumber successful ones so convincingly. So, what does this mean? It means that if the record is broken by 15 seconds each time (I think this is a realistic expectation, particularly as it gets stronger), then one can expect it to happen perhaps once every three years. More likely four or five in the future, but if it were three, then in order to cut another 3:23 off in 15 second intervals, you're looking at around 40 years. But to sum it up as briefly as possible, the point is this. If you want a guy to run sub-2 for a marathon, then you're asking for a capability of back-to-back half marathons in under 60 min. The current WR for the half is 58:23, by Tadese (who hasn't turned that into a decent marathon yet), but for the most part, the top men are running in the low-59s. The very best break the 59-min barrier. In other words, the currently best runners on the planet are hovering around 59-minutes for half the distance that people expect them to run in a marathon, at the same pace. It's a little like expecting Usain Bolt, with his 19.19s 200m best, to go out and run a 400m, slow down just a little, and run a 41s World Record. It's possible, of course, that the change could come from the ability to sustain high speeds, rather than to nudge the entire system faster. In other words, the runners of the future could well run at current 21km paces for twice the distance without the paces for shorter distances changing. That would change the relationship between intensity and duration as we know it, but it is possible if the threshold capacity of runners changes (substantially) in the future. But that's not going to come instantly - there are physiological barriers that must be inched out of the way, not leapt right over. Those relate to the physiological implications, which I have written on before, so I won't go into here. Bottom line is that talking about a sub-2 hour performance after seeing a 2:03:38 improve to a 2:03:23 is just not feasible. The next barrier is 2:03, and I'm sure will go within five years. Then we can begin to work towards 2:02, which will take another ten years, perhaps. It's a great period for marathon running - every season, fall and spring, we get to anticipate a record at least twice. 2013 has delivered a successful attempt, but it shouldn't lull us into expectation that more of the same is just around the corner. Wilson Kipsang yesterday became the 32nd man since WWII to hold the marathon world record. He broke countryman Patrick Makau's World Record by 15 seconds, setting a new mark of 2:03:23. A spectacular performance, in which he managed his effort perfectly, showing patience and the right level of aggression at the right time to finish superbly. I'll tackle the analysis in two parts, one analyzing the race, and later, something on the 2-hour barrier. So, they start fast - the projected time all the way through the first 20km was under the WR. They reached halfway in 61:32, projecting a 2:03:04, and that was, if anything, perhaps a little too fast. It set the second half up as a really attritional race - nobody was going to run even or negative splits, and the question was whether any of the big three - Kipchoge, Geoffrey Kipsang or Wilson Kipsang - would hang on well enough to break 62 and the World record. The pace got slower after halfway. The section from 20km to 25km was the slowest of the race, which you can see as the peak in the graph above. Note however that the pace never once dipped below 3:00/km, and that the range was between 2:54 and 2:59. That's remarkably precision. Once regathered, Kipsang was mighty impressive in the final 10km. He took the initiative, as the "senior" man in the race, and drove the pace even faster. Only Kipchoge was able to respond and that was fleeting too. 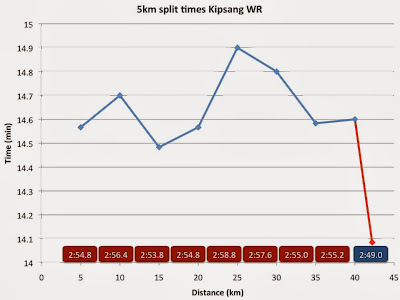 Kipsang ran a few kilometers in 2:49 in that second 30km to 40km, which means there was some in the range of 3:00 too. Eventually, with 2km to go, he found the big final effort and finished incredibly fast - 2:49/km for the final two, and that was ultimately the difference. 15 seconds, and it came, largely in those final kilometers. Of course, that's only part of it - the work had been done to get there. Overall, it was a very well controlled race. Mature, patient, but also aggressive. His pace-makers did an amazing job up to 30km, and while they may have been just a touch fast from 10km to 20km, it never got out of control. Taking a broader view, Kipsang paced the marathon almost like a mile race. If you break the race into quarters, you get the following for his 10km splits: 29:16 - 29:03 - 29:42 - 29:11 (plus that final surge). The "shape" of that race looks like a typical mile WR - Fast start, slowest in the third quarter, and then the surge. It was an excellent management of his physiological resources. In terms of where improvement can come, Kipsang finished very fast, suggesting a reserve, and the ability to go slightly faster. But it's not huge. It's not like when you or I finish a 10km and find a surge in the final kilometer that sees us run 20s/km faster than our race average. In this world, a reserve is being able to go 4-5 seconds per kilometer faster, and so it really is on the limit. Kipsang is also 31, in his fourth year of marathon running, and set this WR in his 7th race, which is a long time to reach a peak. Typically, the fastest marathon of an athlete's career happens between 2 and 4, though there are exceptions (Gebrselassie took a while to perfect the race, and then improved steadily quite late). Kipsang then, may follow a similar approach, and improve again, but the 'safer bet', as it always is, is that he won't. Behind him, Kipchoge made a big improvement on his debut, which was already impressive at 2:05 from earlier this year. He's now a 2:04 man, and on the path towards 2:03, so it will be very interesting to follow whether he can continue that, or whether there's a 'glass ceiling'. The same goes for Geoffrey Kipsang, who "only" ran 2:06:26, but was there for three quarters of the race, and who may yet be able to turn that into an entire race one day. Then of course there are the Ethiopians, a group of young runners in the 2:04 category, and who may challenge, and there are other Kenyans who've been hovering in the same region. Marathon running is incredibly deep and strong at the moment, which means we'll get to enjoy similar races and record attempts at least three or four times a year for the foreseeable future. But for now, it's Wilson Kipsang, with a spectacular performance, who holds the distinction of being the fastest ever. Final thought - the guy who ambushed the breaking of the tape to promote prostitution has been charged with trespassing. What should happen to him is that he should be sent to Kenya, preferably Eldoret or Iten where all the elite runners train, for three months of community service work. Let him serve in any was possible (he can carry water and drive behind the runners on long training runs), and learn some respect for the runners of Kenya in the process. Idiot. Wilson Kipsang has broken the Marathon World Record! 2:03:23 in Berlin. Here is how he did it, splits and analysis from the race! I'll post more later! 15km: 43:45. 14:29 for the last 5km, pace of 2:54/km, the fastest so far. Projecting 2:03:04. 40km: 1:57:12. 14:36 last 5km, projecting 2:03:38. Epic finish coming up! Finish: 2:03:21. The World Record is gone! It's on. Final 2.195km at 2:54/km will get the WR. By 1 second! As you can see above, that's what they've done since 30km, and so the record is a real possibility. Kipsang leads Kipchoge by about 10 seconds, so it is a one-man race for the WR. Silence now until the end, I'll fill in the blanks later. This will be a "sprint" through the Brandenburg Gates for the World Record. Kipsang has slowed slightly in the last 2km, so he needs a pick up. But it's so close now, if he can just dig in and find 5 minutes of effort, he'll get this. The pace has now picked up, with the pacemaker having dropped off. 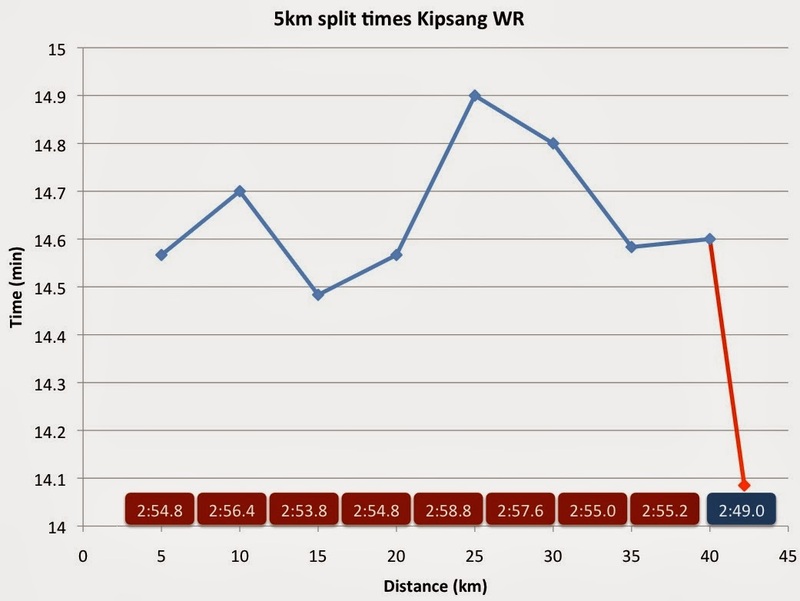 Wilson Kipsang has led the upturn in pace, which has seen the last 5km covered in 14:35 . That included a 2:52 34th kilometer, very fast. Wilson Kipsang is the aggressor, leading the race, but with company from Geoffrey Kipsang and Eliud Kipchoge. Kipsang, as the senior, pedigreed man, obviously has the pressure and obligation to keep the record viable. With 10km to go, the TV graphic suggests that a 29:30 10km will be needed. That is definitely feasible. The pacmaker fought to about 31 km then dropped off, leaving the big three. It's the Kipsangs, Wilson and Geoffrey, along with Kipchoge. So as expected, those three fight for the win. Whether their fight produces a record, that's the intrigue. They've remained slightly slower than WR pace. 2:58/km gives 14:48 for the last 5km, and a projection of 2:03:48. So, having been well under WR pace at halfway, it's now going to take a real aggressive final 10km to get the WR. Whether anyone will take the 'risk' in the company of other men is going to determine how close they get. That will depend on how they each feel, of course. At this stage, it's a good time to consider who the viable candidates are. Wilson Kipsang, Geoffrey Kipsang and Eliud Kipchoge are all there, as is one pacemaker, and Kirwa and Kipchirchir. An all Kenyan front five, plus the pacemaker Rono. Five men is good in the sense that 'company' helps in the latter part of the race, but it will be interesting to see how the racing affects the pacing, as it were. It was this segment where Patrick Makau made the surge that would drop Gebrselassie on route to the current WR in Berlin. He ran a 5:30 2km segment then, which certainly helped his race, but probably cost him some time. So the comparison with Makau, which up to now has seen 2013 ahead, will probably look different at 30km, but that's still OK - there are 12km to go from that point, much can happen. The last 5km were run in 14:54, which is 2:59/km, the slowest segment of the race. You can tell the pace had slowed because the front group at halfway was thinning out, and it has now expanded again, as runners who had dropped off have come back on. That's always a sign. The projection now is 2:03:35, and so it has suddenly come back from being a big WR projection, to a touch and go race. At this stage of the race, patience really counts for a lot, so the slowing is not necessarily a bad thing. The temptation, as the field thins out, is to get aggressive, because you're on the way "home", as it were. We've seen in London and other big city races how aggression at 25km often blows the race open, but it comes at the cost of the fast time. So it's important here to be patient, and avoid a 5:35 surge for 2km that can easily derail the WR. Kipsang of course did that in the Olympics, not off a WR pace, but may have learned from that. They do have a buffer of around 30 seconds for this second half - a 62:00 still gives a WR. 61:32, so a WR projection by 34 seconds. It promises to be an intriguing second half. For one thing, the pacemakers will drop at around 30km, and then it will be up to the big three, assuming they're all there, to decide how best to push the pace to keep the WR in view, while still racing and not pulling a colleague to the WR. That will be perhaps the race's decisive moment. 58:19 at 20km, the projection is for a 2:03:02. The last 5km was 14:34, so 2:55/km, but there were reports that the 18th kilometer was 2:52, which is very fast and suggests a little bit of oscillation. Again, the athletes can see their pace and the projected time continuously in Berlin, so when the pace is faster, it's not an accident caused by lack of information, it's a conscious decision to ramp the pace. They are being incredibly aggressive, and that makes for an interesting second half. They should hit halfway in about 61:30, and so the second half is guaranteed to be attritional. The question now is whether it is attritional enough to cost them the WR, or whether they hang on? The pace has actually increased - 14:29 for the last 5km, and the projected time is now down again, to 2:03:04. This is quick, and maybe cause for concern. If you're 15 to 20 seconds up on WR pace through halfway, then that's bordering on reckless. So it will be interesting to see how the section 25 to 35 km goes. That's often where the "interest" payments are made. A TV graphic is showing that they're currently 36 seconds faster than Makau was at the same stage - the coverage is good so far. Remember that Makau had a race with Gebrselassie that really jacked the pace up after halfway, so that gap may come down later. The optimal way to run is even pace, so the Makau comparison is less informative, but interesting. Also, in Berlin, runners have access to the car in front of them, which gives all the information required to manage the pace. It even gives a projected time, so if they're running under 2:03-pace, then it's because they have chosen to, not because they're making a mistake in the absence of information, which is important to consider. Florence Kiplagat has gone through 15km in 49:27, which projects a 2:19:06, so she has slowed very slightly, but still on course for a big PB and significant performance under 2:20. The pace has been maintained, 14:42 for the last 5km. That's very steady. The biggest challenge is consistency, so it would be good to see splits by kilometer, rather than 5km, because that would tell you exactly how the pace is fluctuating. Physiologically, there's a big difference between going 2:52-3:00-2:52-3:00, and running 2:56 every kilometer, even though overall it's the same pace. So far, that seems to not be the case. A TV graphic showed a sequence of kilometer splits and the range seems to be narrow - 2:54 to 2:58, so it's a good pacing job so far. If that continues, then the record is on, and the only determinant is the condition of the atheltes. No splits from the leading woman, who is Florence Kiplagat. They're saying her timing chip is not working, so the only splits coming through are for the women in the group behind her. Will get a split as soon as possible. She's just gone through 12km in around 39:30, which is 2:18:50 pace, so Kiplagat is going fast too. 14:34, which projects 2:02:56. The target was apparently 14:40, so they're inside it. For now, not too damaging (though of course there may have been a 2:40 km in there, I'm not sure), but that is quick. There's more risk of losing the record by going too fast at this stage. Not surprisingly, the big three are in the group, along with perhaps 7 or 8 others. That should thin out at this pace. As we wait for the first split. a prediction. I don't think the WR will fall. Too many things have to be absolutely perfect. Weather, conditioning of the athlete, the pacing, the intent, and the presence and support of other runners when it counts. If any of those factors are even 5% below optimal, the price is stiff and the record is gone. I don't think that the three big names in this race have the necessary ability, so my call is a time just outside 2:04. Let's call it 2:04:15. 5km split next. Bolt vs Farah at 600m. The extremes meet, who wins? For athletics fans, the prospect of Usain Bolt vs Mo Farah over 600m offers an enthralling spectacle where the most dominant athletes at the extremes of track running test themselves with one foot in the other’s domain. I suspect it is highly unlikely to happen, but it's a great platform for some debate around performance physiology. Predicting the winner is a fun exercise in stats, performance analysis and physiology (performance analysis - it's not an exact science, remember!). The fascinating question for this one is where do the physiologies of these two “extreme” athletes cross? Of course, bear in mind that there are athletes in the middle who would arguably beat both Farah and Bolt over 600m, and by a long way. When David Rudisha broke the 800m WR in London last year, his 600m split time was 1:14.3, and that's about as fast as I suspect Farah or Bolt could run in a straight 600m. Rudisha's 1:40.91 predicts something under 1:12 for 600m (the world record is 1:12.81, and that's from Johnny Gray, who was 1.6 seconds slower than Rudisha at his best), so he would certainly win a 600m were he in it. In fact, so would just about the entire men's 800m Olympic final field, and a good few 400m, 400m hurdlers and 1500m runners (the 800m/1500m combo guys) too - this 600m is not about finding the best athlete, but about some fun and publicity! Physiologically, making the prediction invites some discussion over the origin and capacity of the energy pathways used by each, and what it means for fatigue. It boils down to different questions for each man. For Bolt, it’s whether he can withstand the fatigue of going three times further than his normal race distance, and how much he would need to slow down to avoid complete failure to even finish the distance? For Farah, it’s whether his top speed is high enough to pressurize Bolt into that premature fatigue? A quick physiological lesson will explain: When you see athletes tying up and slowing down dramatically at the end of a sprint race, what you are witnessing is the combination of a "failure" of energy production (the supply can't meet the demand), a build up of metabolic by-products in the muscle and the central and peripheral responses to these changes. Nobody knows the full explanation for this, and it’s likely more complex than any current theory can explain, but the result is a reduction in muscle contractility with sub-maximal muscle recruitment. Studies have shown, for instance, that at the end of a 400m race, drop-jump performance declines by 39% and that muscle activation increases, which shows the cumulative effects of fatigue on muscle function - more recruitment needed for less force/power. Other studies show that this happens despite pacing, and the presence of some muscle unit reserve, which implies that fatigue occurs partly in the brain, partly in the muscle. The source of energy is crucial to both fatigue processes, because it affects the biochemical changes occurring in the muscle. Bolt and Farah rely on different pathways for their energy. Bolt has a highly developed pathway that produces the energy needed for muscle contraction very rapidly, but not for very long. His energy comes primarily from what are known as oxygen independent (or anaerobic, though this word is avoided by many) pathways. They are all about the speed of energy supply, and the consequence – a build up of metabolites, is an accepted downside because he doesn’t need more than 20 seconds of explosive power. Farah, on the other hand, can produce energy for hours, but more slowly, using primarily oxygen dependent, or aerobic pathways. The upside is less peripheral accumulation (though glycogen depletion is, eventually, a theoretical 'limit'), the downside is the rate of supply. This difference accounts for the clear differences in the optimal pacing strategy between short duration and long-duration events, something I summarized in this review article for BJSM. There is always an overlap, with some contribution from both pathways, no matter the distance, but for shorter, high intensity exercise like sprinting, the oxygen-independent pathways are more heavily relied upon (in the 200m event, for instance, the split is around 70%-30% in favor of energy production without oxygen. By 1500m, it is reversed to 30%-70%). So, as much as Bolt and Farah lie at the opposite ends of the performance spectrum, they are also extremes of biochemistry. Muscle histology and function also differ – Bolt’s are more contractile, able to contract rapidly and forcefully, but they also fatigue more rapidly. Over the nominated distance of 600m, Farah would be forced to find a force and speed of muscle contraction and energy production that he is unfamiliar with, while Bolt will be asking his biochemistry to withstand an accumulation of metabolites and resultant fatigue that he is also unaccustomed to. As for a prediction, the biochemical odds are slightly tilted in Farah’s favor at 600m. A number of people have attempted to model where the perfect distance is, and using the above-mentioned energy pathway models, have estimated that the perfect distance, with equal performances, lies somewhere between 500m and 550m. Those additional 50m, seemingly trivial, probably just give Farah the edge and represent 50m too far for Bolt’s physiology. Farah’s famous finishing kick, as well as his recent 1500m performance, a European record of 3:28, have shown that he has extra-ordinary sustained speed for a distance runner, so the biochemical “jump” to a 600m may not be as large as the step up from 200m to 600m for Bolt. On that performance note, Farah's 600m performance is easier to predict and is more familiar to him - it's something he'd do regularly in training, whereas Bolt would very rarely approach even sub-maximal efforts for this duration. Performance-wise, Farah's 3:28 suggests that his 800m performance would be in the range of 1:45 to 1:46. That would optimally be achieved with a 51-52s first lap, and a 53-54s second lap. That in turn suggests that a very fast 400m of 49s would be possible. Then it becomes a question of limiting the slow down, and finishing with a time around 1:14-1:15. It's about starting fast enough to take advantage of sustainable speed and attenuated slowing down at the end. Bolt, on the other hand, has to worry about the opposite problem - not starting too fast. He has run 400m in under 46s almost every year since 2007, including a PB of 45.28s six years ago, and a 45.35s at the age of only 17. So he may have the natural ability, if he judges the pace well, to edge Farah. However, six years is a long time, and those low 45s are probably less relevant now, particularly since he has probably gained mass since 2007. Mass hurts over longer distances, so Bolt has this to deal with as well. If Bolt does go out in 48s, gaining an advantage of around a second over Farah, he'd need to hold on to around 27s for the final 200m, and I suspect that would be a little too much to ask. With a month of dedicated training for the 600m distance, my money would be split. In my opinion, it would be a coin toss - Bolt would be able to change the training enough to adapt just enough to make it incredibly close. But, if the race were to happen straight after their specialized seasons, Farah has the edge. I'd pick Farah by about half a second to a second. Over 550m, maybe it comes down to the lean. It would be a fascinating meeting of two extremes. It would sure be fun to watch, and discuss - that happens over on Twitter and Facebook!